Mission Statement: We work and worship as God's family, drawing others to a loving and forgiving Savior, celebrating a new life of commitment. First English Lutheran Church is located in downtown Punxsutawney at the intersection of North Gilpin St. and Pine St. (see Map & Directions for details). 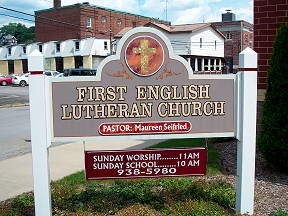 First English Lutheran has a variety of ministries. Currently, our weekly Liturgy of Holy Communion is at 5:30 PM on Saturday evenings. We also have special services for the Wednesdays during Advent and Lent, Christmas Eve, Epiphany, and Holy Week. As a Lutheran congregation, music is a vital part of our ministry. Our vocal choir, handbell choir and recorder consort are regular participants in our worship service. We also host concerts by musical performers from outside of our church family, including the Russian group LYRA, guitarist Terry Sabo, and a community choral concert. Child-In-Our-Hands, Wednesday Afternoon Church School, and Summer Vacation Bible School are our grade school youth ministry activities. Each event focuses on a biblical theme with related crafts and activities. Wednesday Afternoon Church School is held on the 2nd and 4th Wednesdays of every month (except when noted otherwise). Child-In-Our-Hands gathers around religious and secular holidays. First English also nurtures children in the Christian faith by offering camperships for children and families to attend Camp Lutherlyn - a Lutheran Camp of the Northwestern PA and Southwestern PA Synods. For youth looking to affirm the promises made in baptism, confirmation classes are held on Sunday mornings at 10:00 AM from September to May. Adult Bible Study is conducted from September through the following May and book discussion groups meet bi-monthly. First English also supports many local and international social organizations with donations. These organizations include: ELCA World Hunger Appeal, ELCA Disaster Relief, Heifer International, Woodland Avenue Food Pantry, Salvation Army, Jefferson Area Lutheran Social Ministries, and others.